Last year there just wasn’t enough hours in the day to spend any real time on the vegetable growing side of things. With a day job as well as the livestock and other land management tasks taking up all of my time, it was a tough but ultimately the best decision. In the end I simply had to accept that some areas had to be left untouched and that they would inevitably disappear under the weed growth. There was no way I could keep on top of all the available growing space so it was better to tackle just a sensible and manageable amount. This year I hope to build on that hard lesson by increasing the growing space used – but just a little. A combination of shorter but more frequent weeding sessions and also plenty of mulching should help to keep on top of any weeds. 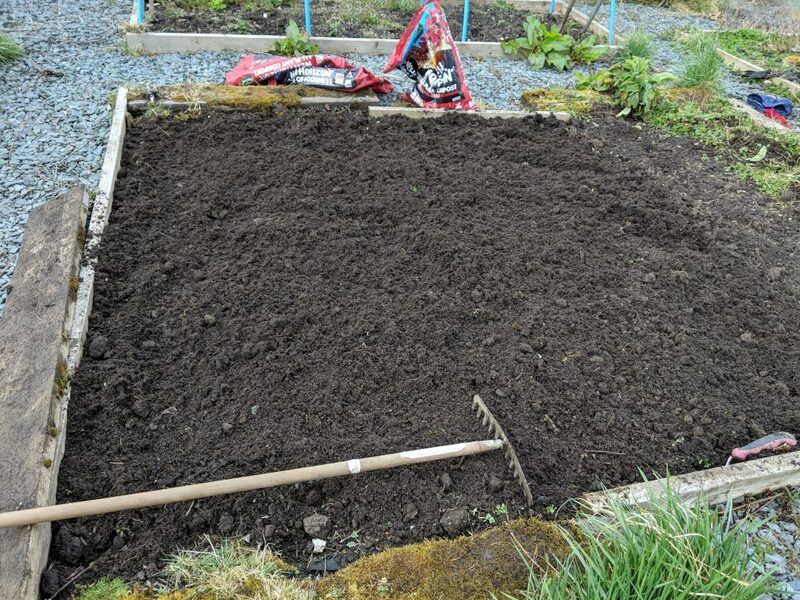 The first batch of outside seed sowing has already been done with some carrots sown in the left hand bed shown below. This also has a plastic cover over the top just to help protect it from the cooler evenings we still seem to get at the moment. The other plastic cover has been put in place ready for planting out other vegetables later on. Nearly all of the raised beds are looking very respectable at the moment and just about ready for sowing or planting out. 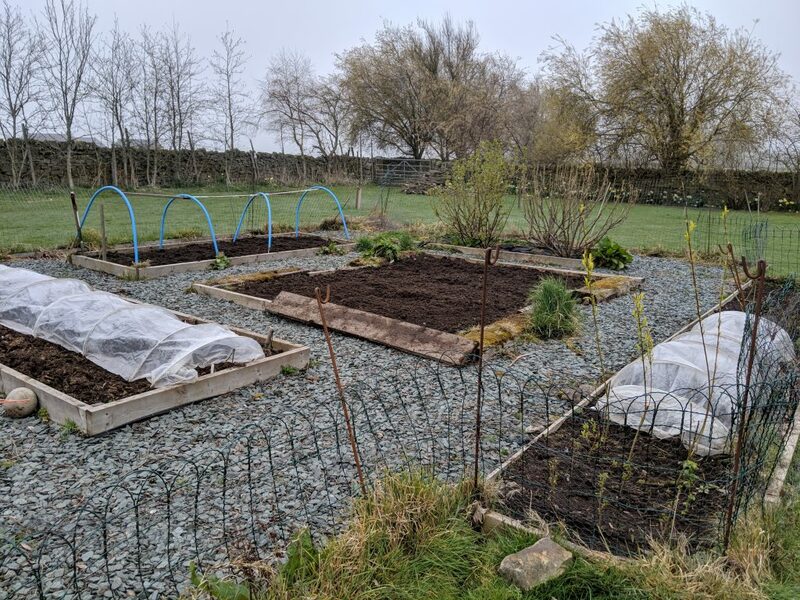 The raised bed containing the soft fruit (far right) still needs some care and attention but that has a weed fabric in place so any tidy up shouldn’t be too difficult. Now that it finally seems the last of winter has passed, over I can get on with some proper seed sowing the course of the next week or two. This will be a more concentrated effort because in previous years I’ve tried spreading the work out and ended up getting confused with what was planted and when! When is a dwarf bean no longer dwarf? 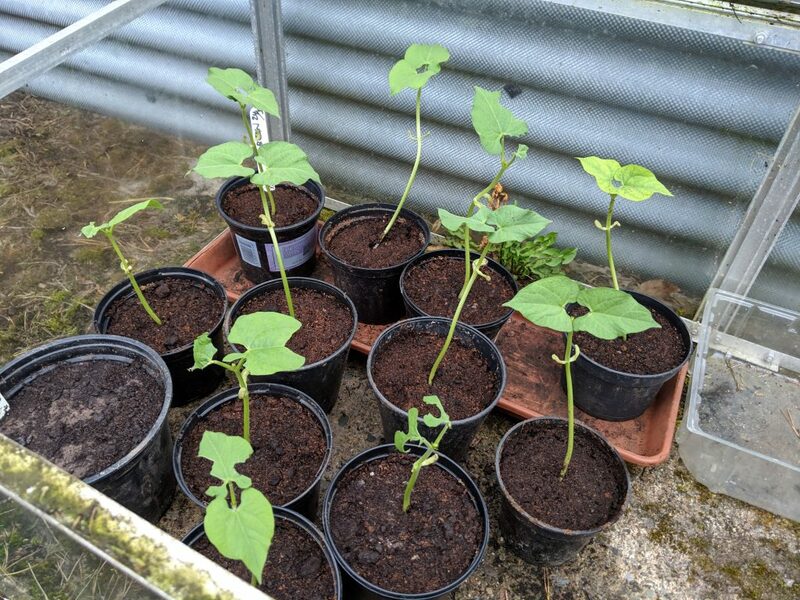 The very first early seeds were sown a few weeks ago using a donated heated propagator but they have been a little too successful I think. These are supposed to be dwarf beans and they have got a bit ahead of themselves. These poor plants also suffered when I was potting them on last weekend. The chickens spotted them while my back was turned and in the space of a minute or two they had descended on them. Luckily the damage wasn’t too bad in the end but some of the leaves must have been a very tasty treat! The miserable weather seems to have gone away (for the moment) so I could start on some of the pending jobs that have been put off due to the wet ground. First up was a move for the cattle into an adjacent field which, although not perfect by any means, is definitely better for them than their previous watery, muddy home. There was a slight detour at first when the back garden seemed a lot more interesting to them. This was mostly due to Daisy taking advantage of an opportunity but I managed to herd them back to the right place without too much collateral damage. Once they were into the correct field they soon settled in with a bale of hay and some fresh water. A short time after the photo above they were spotted having a quick snooze in the welcome early spring sunshine. As I had hoped, a similar kind of move for Esther and her litter went completely to plan with no detours or other shenanigans. So long as the piglets can see their mother they will happily wander along behind her. However if they lose sight of her then all bets are off! The hardest part with these moves is keeping everyone moving along together because they can be easily distracted by tasty tufts of grass, an old tree branch or a quick root around in the mud. There was even a chance for the new (and nosy) neighbours to check on things as we made our way through the woods to the new pen. In no time at all the pigs were happily into the designated pen and exploring their new space. Of course, Esther had to adjust the straw in the pig ark because she’s never happy with my initial efforts but she’s a great mother so I can put up with that. It may not look much yet but it’s home! For the piglets the first hour or so also involves testing the electric fence with associated brief squeals but it doesn’t cause any permanent damage for them and they soon learn the limits of the pen. Now I can see that the weather forecast shows -2° C here overnight but I know the pigs will be fine, huddled in a pile with their fresh straw. As for the Dexters, I’m not sure they’ll notice as they’ve still got their thicker winter coats for the moment. Living up a hill in the North Pennines at 1000ft above sea level, I had assumed that water wouldn’t be too much of a problem for us. Why should we worry about that when we are all taught in school that gravity means water will naturally flow downhill. We are another 200ft above the main village so it would seem logical to expect that any excess water up with us should flow down to the village and on into the River East Allen down below us. From there the water can merrily flow on to join the River South Tyne and then head towards Newcastle before in due course meeting the North Sea at Tynemouth. However it turns out there is more to this than I first knew. For one thing, the geology of our general area means that there are many points where water simply emerges from underground as a result of the rock formations. This is not a bad thing in some ways because our house is on a natural spring water supply! 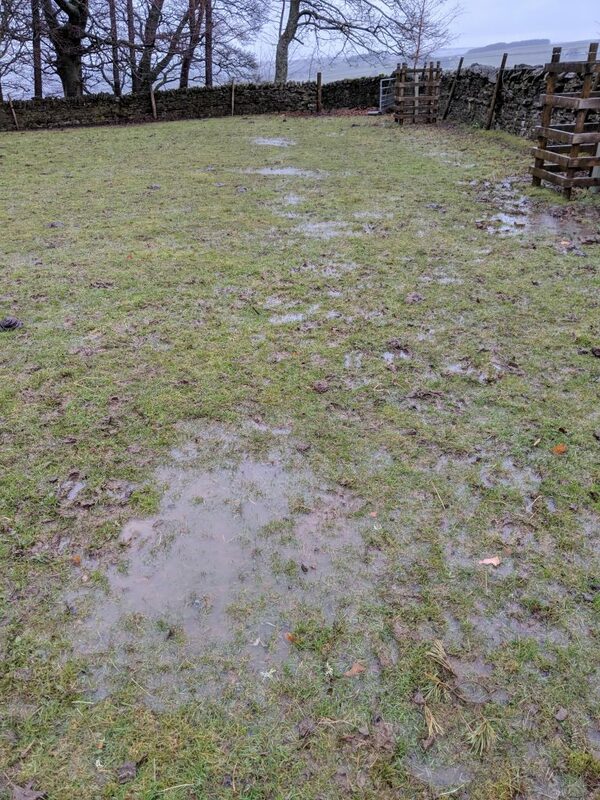 Add to that the fact that drainage in some areas of our small patch could definitely be improved. Not so much to turn all this water into someone else’s problem but just to get the excess to run in the right places where it can be better managed. Standing water at 8am with rain due all day! I don’t claim to understand the subject in any depth but I can appreciate that if water flows more slowly from the moors at the start of the process then it will help. Reducing the amount of water and the speed at which it flows down will reduce the risk of flooding for built-up areas further away. Faced with a day of heavy rain today and a small herd of Dexter cattle that live outdoors all year round it was clear that a smallholder with a soft streak like me had some quick decisions to make. 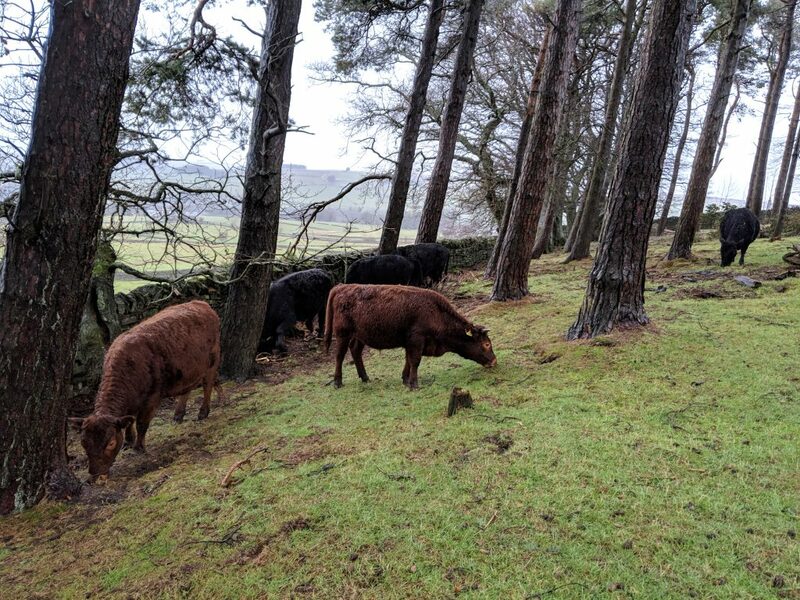 Top of the list, I decided that it would be good to let the cattle have a small section of woodland which would keep them out of the worst of the wind and rain for today. 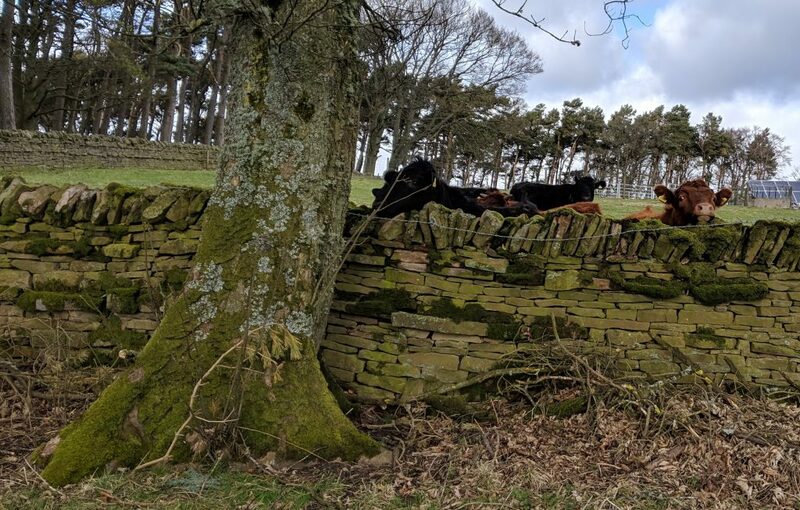 They may be a hardy breed and quite happy living outside in the UK climate but that doesn’t mean I’d be happy sitting inside my house knowing they are just sheltering behind a stone wall. Whenever I collect another batch of pork from the butchers there is always a real sense of pride along with all the other obvious feelings. Pride partly because we have produced something ourselves but more importantly we are proud to have reared animals with the respect it they deserve and given them the best life possible while they were with us. 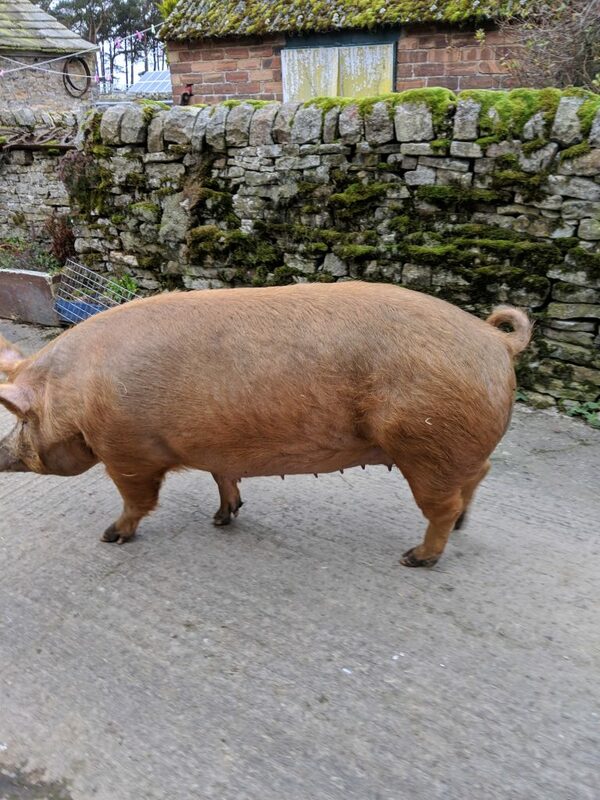 As it turned out, the latest results were some of our best which is particularly pleasing because rare breed pigs (not just Tamworths) can be quite tricky to rear with the right balance of meat and ratios. 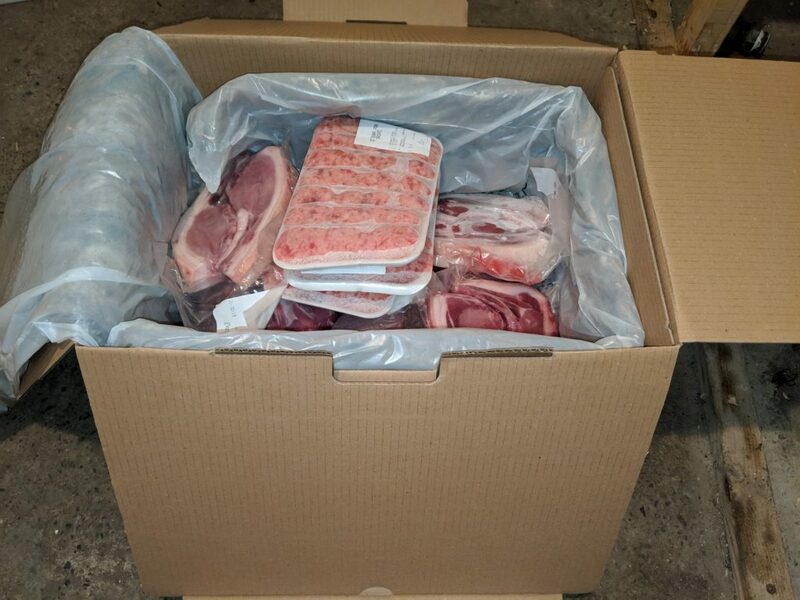 In no time at all, our larger pork selections boxes were all sold, in some cases before we had even collected the meat from the butchers. It’s nice to know that the quality of meat from our Tamworth’s is so highly regarded! Recently we’ve been trying out the Wool Cool insulated boxes from 3R Sustainable Products and have been very pleased with the quality. This will come in very handy for the future as word spreads and we start to deliver further afield either ourselves or by using an overnight courier. In the meantime, there is pork fillet – great for stroganoff or stir frying – or some chops and diced pork – both of which are great from our slow cooker. Of course there are always sausages available in a range of flavours including traditional, pork and leek, cumberland, lincolnshire and more. 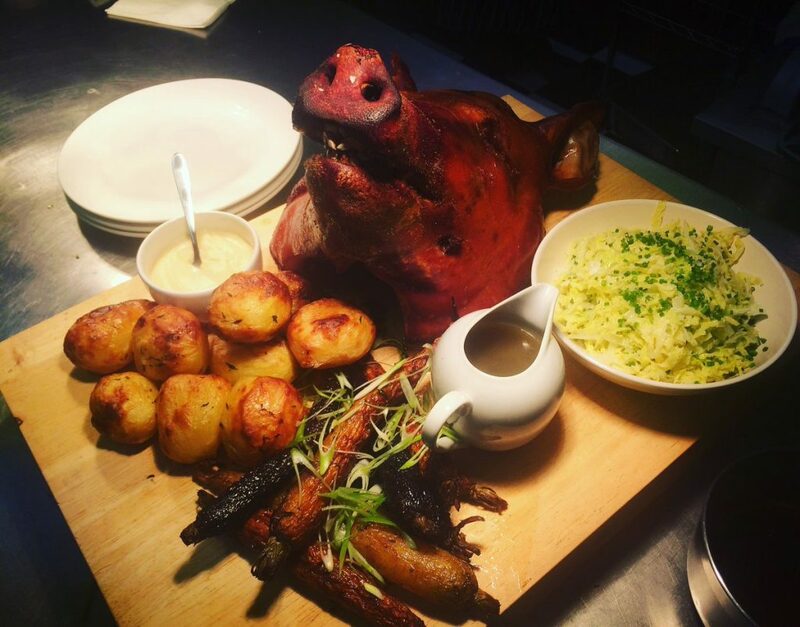 If you’d rather eat out then Gary Dall at The Roxburgh, Whitley Bay has done some really interesting things with our pork in the past. Their place in the Good Food Guide 2019 was not easy to come by but it’s richly deserved I’m sure. Despite all the preparations, forethought and planning leading up to Esther farrowing there was still a surprise in the works for us. 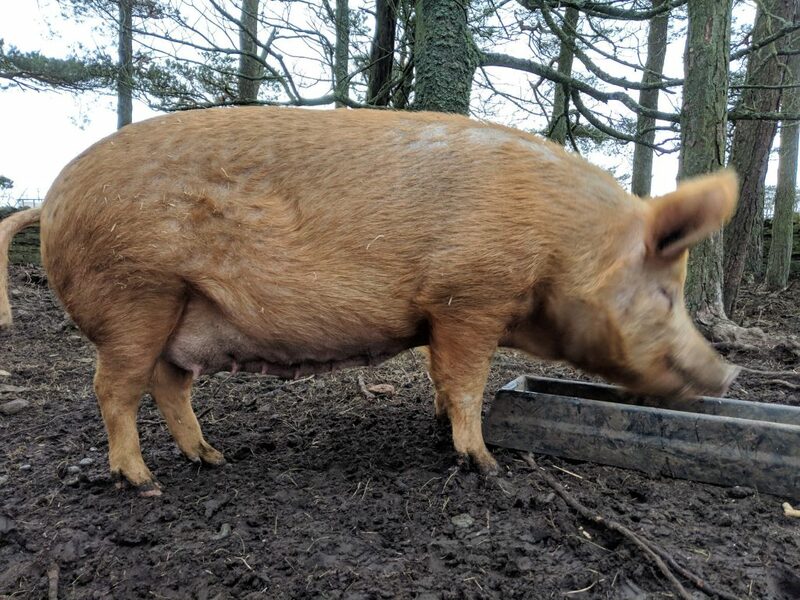 The theory was that we would move Esther into a stone outbuilding nearer the house a few days before her due date so that we can keep an eye on her more easily. 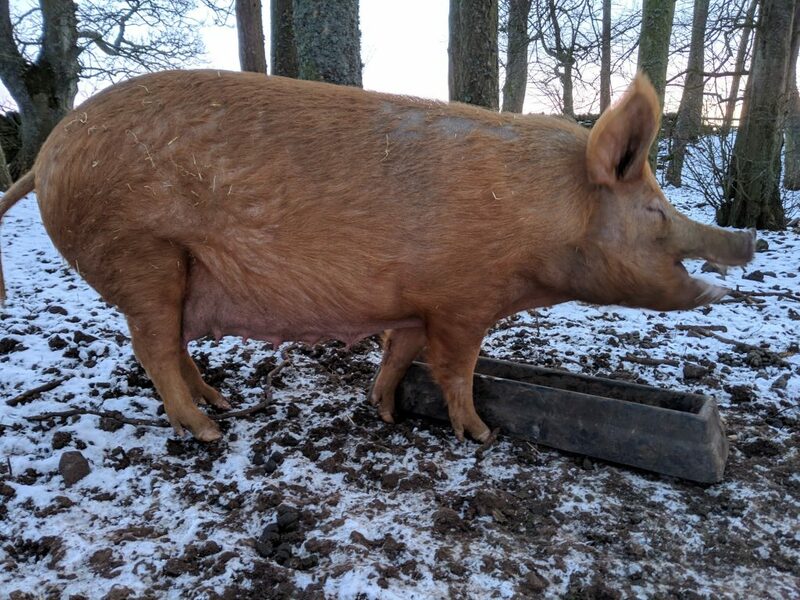 This would also mean she was separated from the 2 meat pigs that have been company for her but were due to go off to the abattoir at about the same time. Having checked her at breakfast time on the Saturday morning, I was happy that she could be moved into the shed at mealtime that same evening. This would mean the meat pigs could stay in the woods until they were loaded in the trailer on last thing on Sunday or first thing on Monday morning. As I got closer to her ark the reason became clear, she’d already farrowed 5 piglets and looked to be still in the process of producing more. Luckily she is a very placid mother and happy for us to be around her even during farrowing. 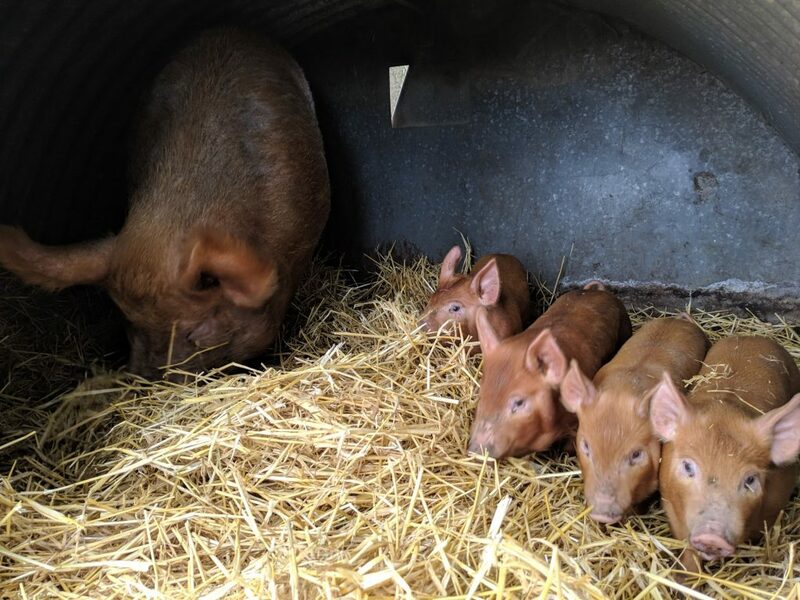 An immediate change of plans was required, I would not be comfortable leaving a sow with new born piglets in the same pen as a couple of mildly boisterous 6 month old boars. 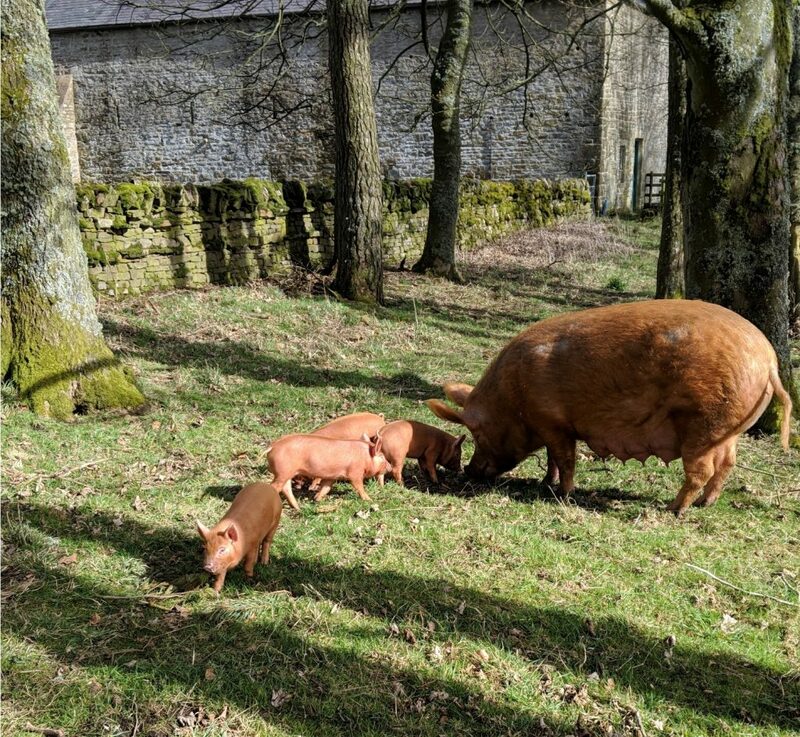 We’ve not had pigs farrowing outdoors before, mainly because we’re fascinated by the whole process and like to feel that we’re helping by being on hand. There have been a few occasions where we’ve managed to save piglets that where weaker when born but that’s not always possible. It’s just a fact of life (and death) that sometimes an apparently healthy looking piglet will be born very weak or even dead and while it’s never easy to see though but we just do our best to help where we can. 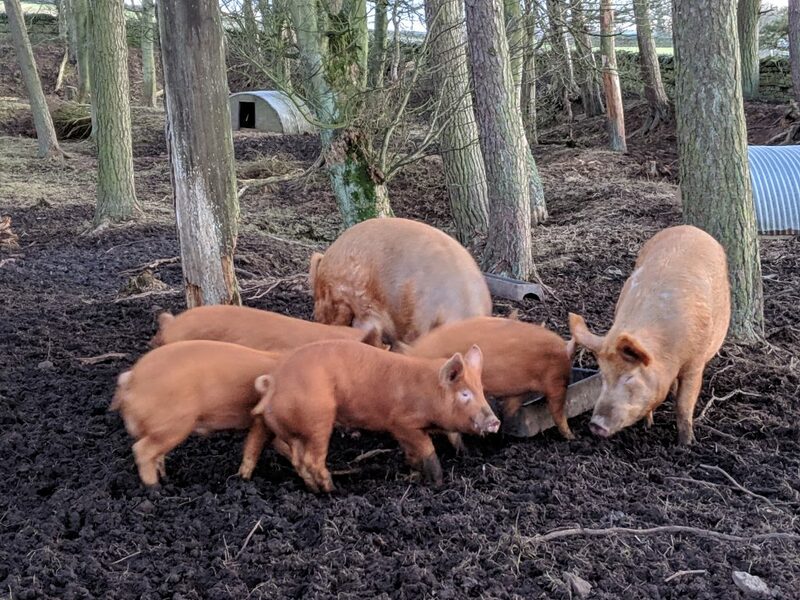 The final outcome for this litter was 3 gilts and a boar – there was another boar that seemed okay at first but sadly he was dead by the next morning. Most importantly for the surviving piglets, their mother was doing well and soon up on her feet again. 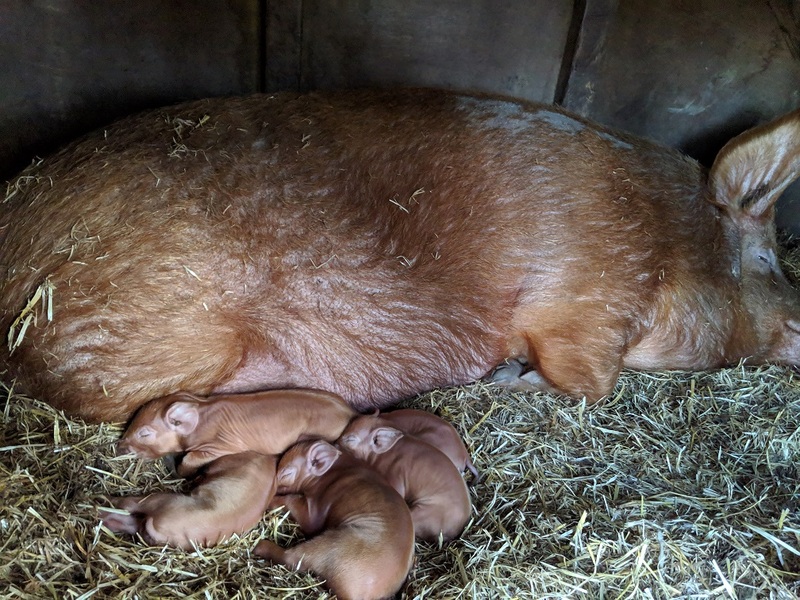 It’s obviously tiring for the sow during the farrowing but she worked up quite an appetite after missing her Saturday evening meal due to the early arrivals. By Sunday morning she was glad of her extra rations and a chance to come out of the pig ark to stretch her legs. 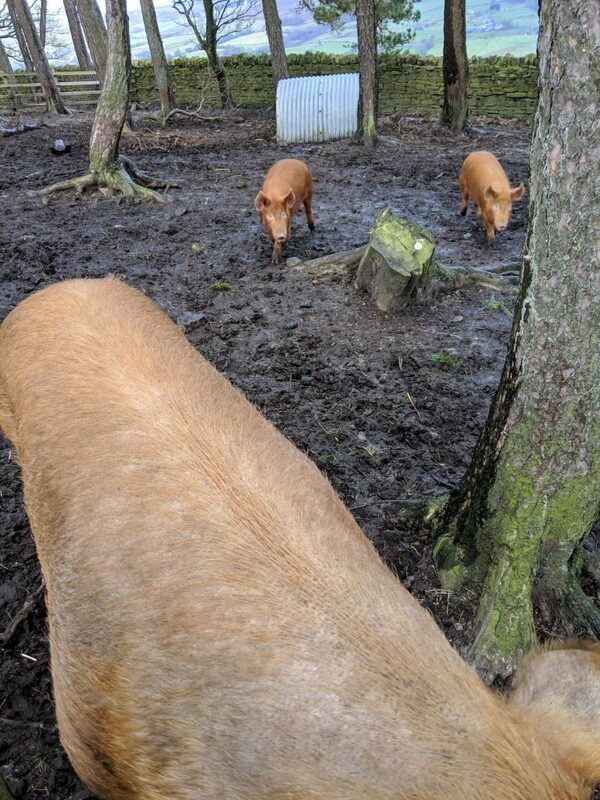 It’s been a troubling time since the last expected farrowing – mainly because I still can’t quite explain why I misjudged events so completely. Admittedly it is true that Sissy already had quite a reputation for carrying a few extra pounds compared to her sister (Esther). Added to that is the constant juggling of time between the smallholding activities and a full time job not to mention the usual family commitments. 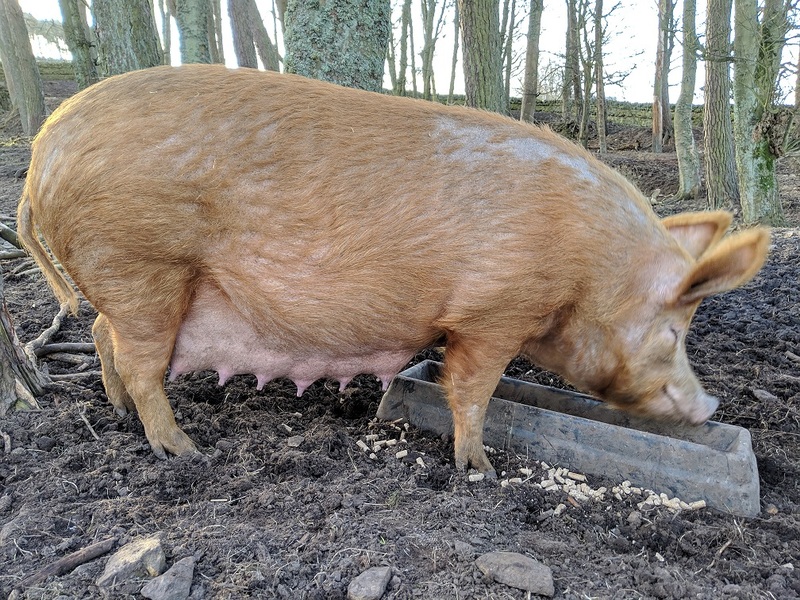 As a result I’ve been doubting myself even more than usual when studying Esther for any of the usual signs as the expected farrowing date gets closer. More recently there have finally been enough signs for me to believe that this time we’ll actually get some piglets around the middle of the month. Next on the list of tasks will be a preemptive worming injection sometime over this coming weekend. 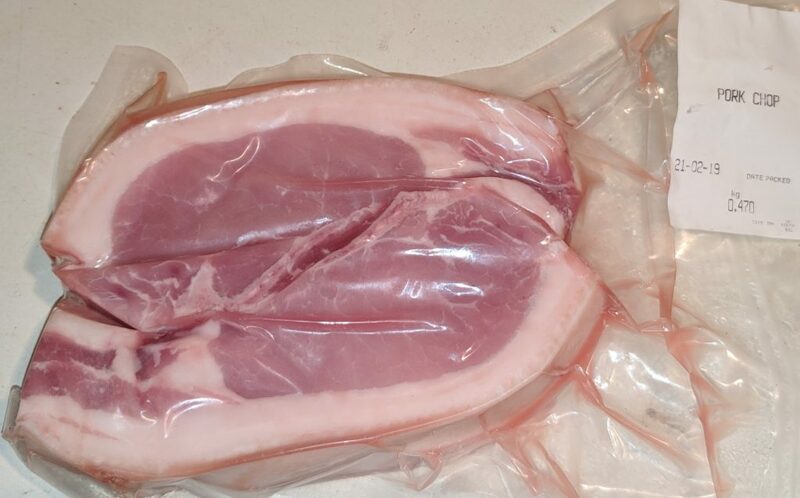 This will not only help her but also passes the protection on to the unborn piglets. That should mean they get the best possible start to life with no unwanted parasites. Now it’s just a waiting game and I’ll be keeping an eye on her development. In about another week or so it will be time for her to move inside in preparation for farrowing. After an extended period with no egg production from our chickens, last week we finally got some more eggs out of them. 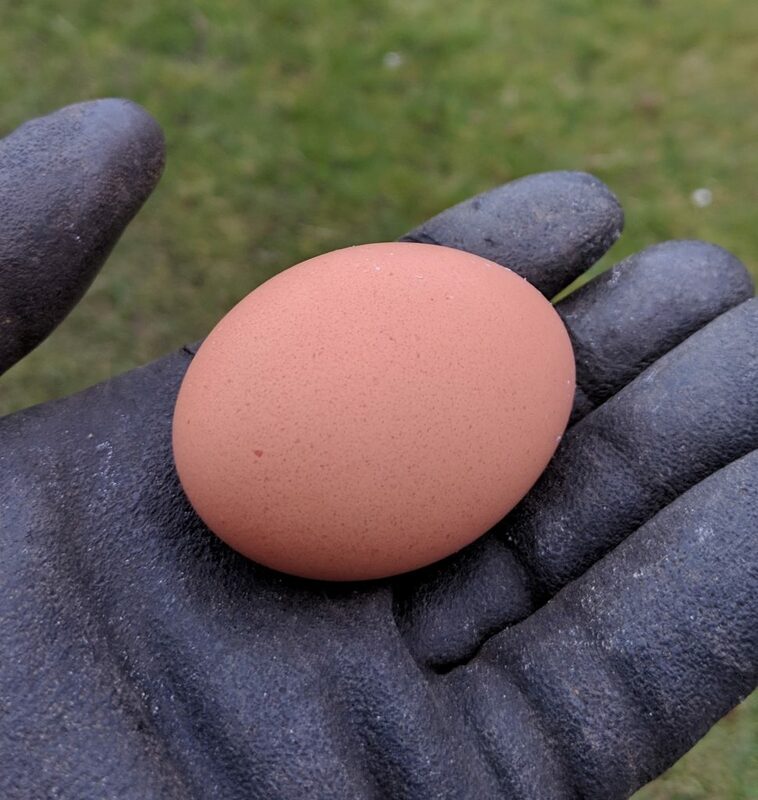 Despite our regular supply of layers pellets and plenty of corn for the long, cold winters nights they had obviously decided to close the egg production down until the days start getting longer. As a result we’ve not had our own eggs for many weeks and eventually had to buy some which was a real novelty after all this time. The pleasure of eating eggs from our own hens was becoming a fond but distant memory. 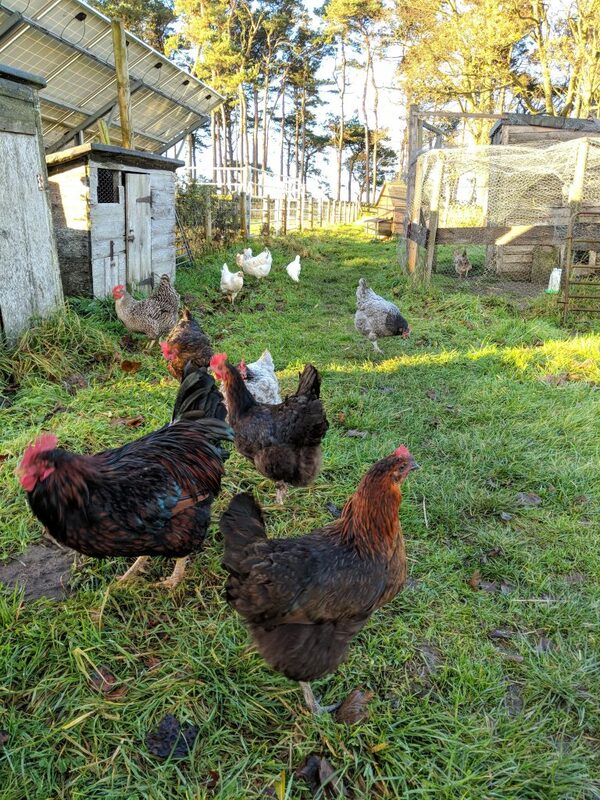 In the past we have bought a few new point of lay hens in early Autumn with the idea that they might produce some eggs during the winter months when out older birds have stopped. This worked well for the last couple of years but unfortunately we never got around to buying more hens last autumn and we took the opportunity to adopt some locally as their owners were emigrating to New Zealand. 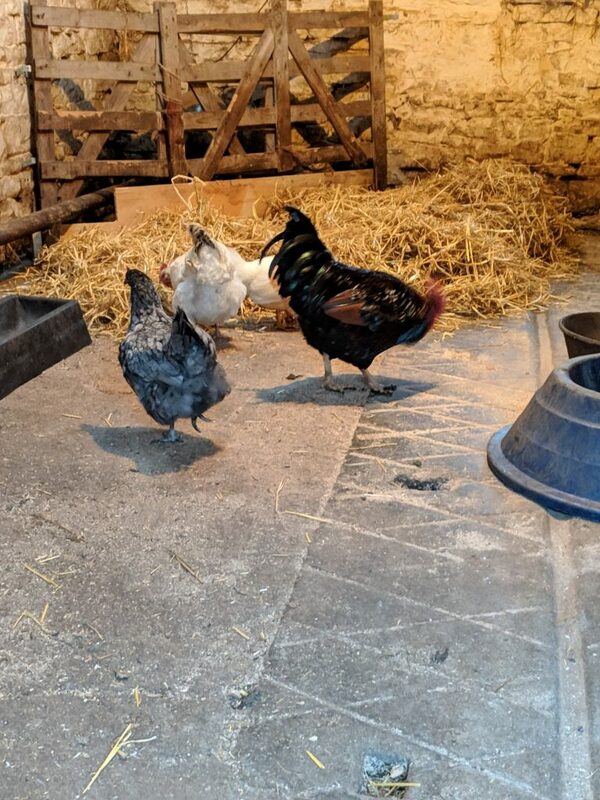 The adopted chickens – Colin the cockerel plus his 3 hens – settled in very well and fairly quickly integrated into our existing flock with very little trouble. They all share the same hen-house now without any problems although some seem to prefer the next boxes over night and don’t want to join the rest on the roosting bars which are higher up. Perhaps they’re too tired to flap up to them at night or maybe they’re just scared of heights? 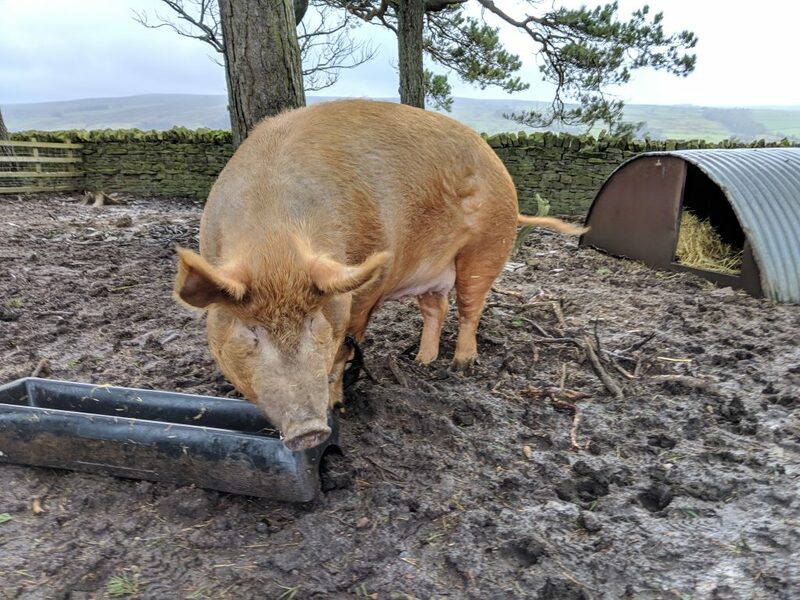 After the anticipation of an impending farrowing and my failure to spot some key telltale signs, I eventually had to admit that Sissy was not actually in-pig as I had originally hoped. Once I realised that nothing was going to happen, it was obviously time for Sissy to take the Walk of Shame to a new pen in the woods. I wasn’t interested in mucking out that shed anymore for a freeloader! As it happens, the remaining 4 meat pigs have now reached the age where I need to separate the 2 non-castrated boys from their 2 sisters. Taking the path of least resistance is always the best option when moving pigs and the first one I got into our trailer was a gilt so that decided the way the move would go. After all, this unfortunate situation can’t all be my fault or can it? Preparations for the farrowing shed were going well earlier this week and included some minor repairs to the piglet corner protection which takes a bit of a beating each year. After putting down some fresh straw with the food and water troughs nicely organised, the quality control team assessed the results and gave it a 5 star rating! 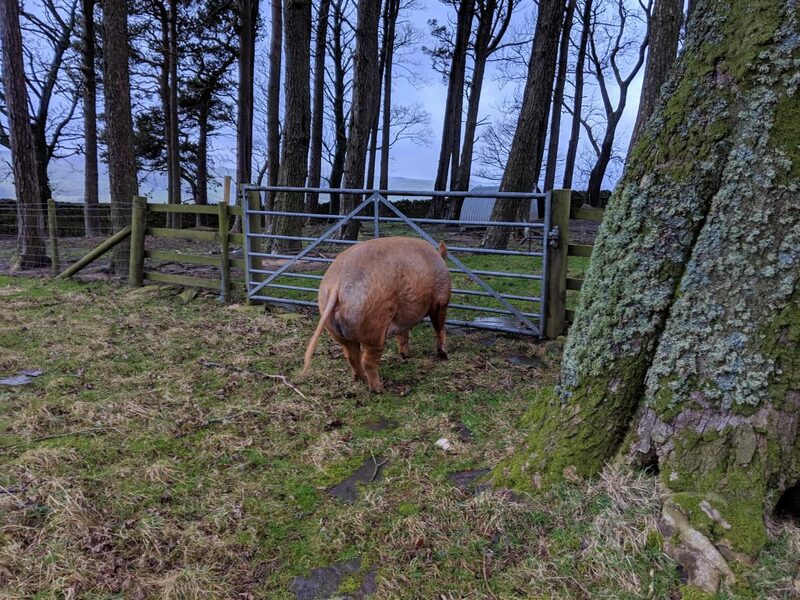 Moving Sissy in from the woods was thankfully relatively straightforward, apart from a minor detour when she decided to explore the next door field rather than head back to the farrowing shed. This caused a brief moment of panic because I know that our Tamworths love to explore new places and we didn’t have the time for that sort of excursion today. 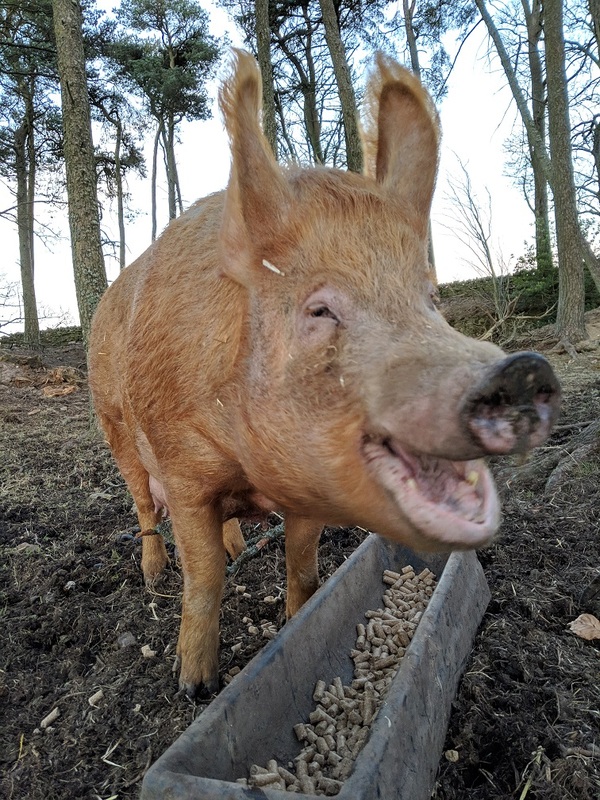 With impeccable manners as always, she (the pig not my assistant) simply trotted alongside me all the way back to the outbuildings. 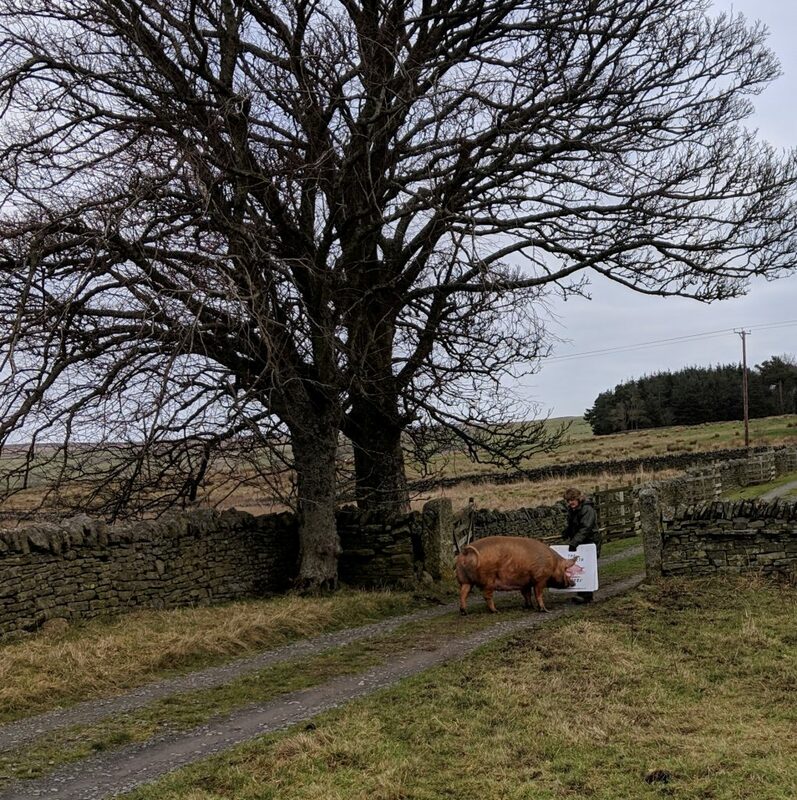 She wasn’t even particularly interested in the feed bucket that I was carrying and almost seemed to remember the route all the way to the farrowing shed. So now we’re all set and the waiting begins. My calculations can be fairly accurate since I know exactly when the artificial insemination happened and using an estimate of 114 days, I’m hoping for a Sunday farrowing. As I recall Sissy seems to favour farrowing during the late afternoon/evening based on past litters so maybe there won’t be any sleepless nights! 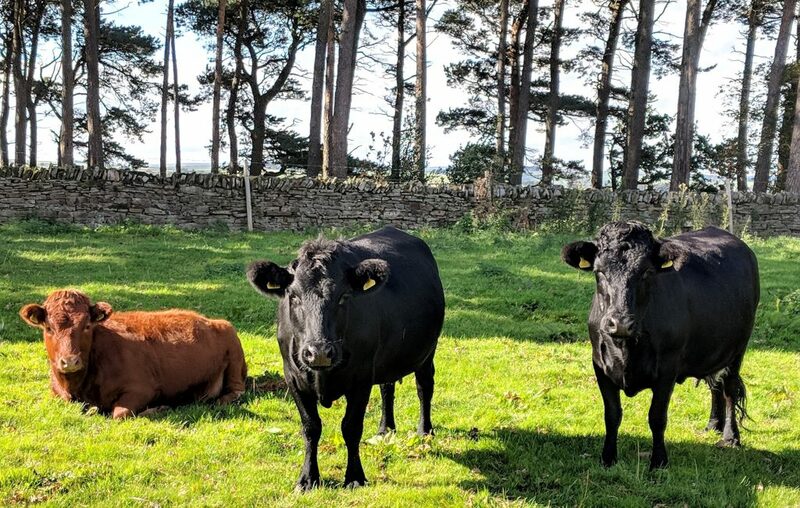 We’re now plunging headlong into autumn and the bull has been to visit recently so I thought I’d post a quick cattle-based update with some great pictures I’ve managed to take. 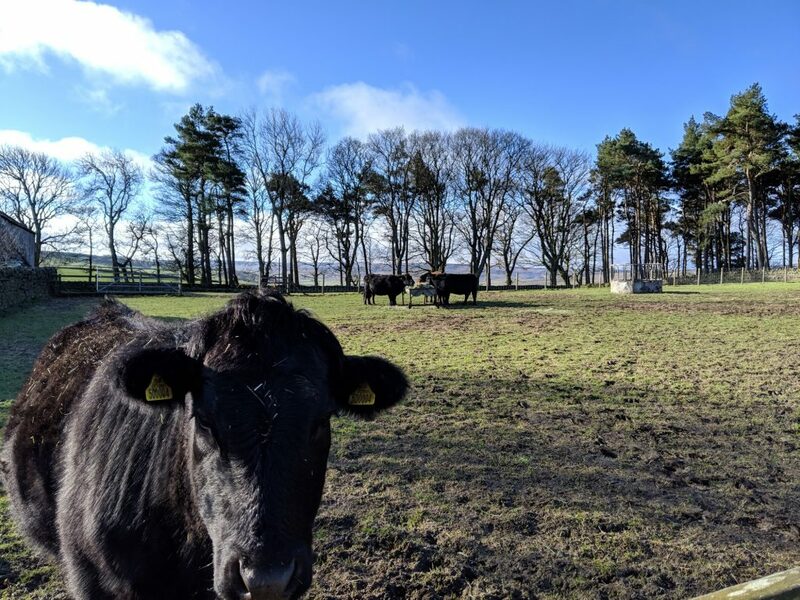 Before long they’ll be starting on the winter feed – hay and silage – so it’s nice to have some pictures of them while there’s still some grass around! This time we stuck with the same bull that we had hired last year – officially he’s known as Baranduin Delta – since we were pleased with this years calves when they turned up in June. 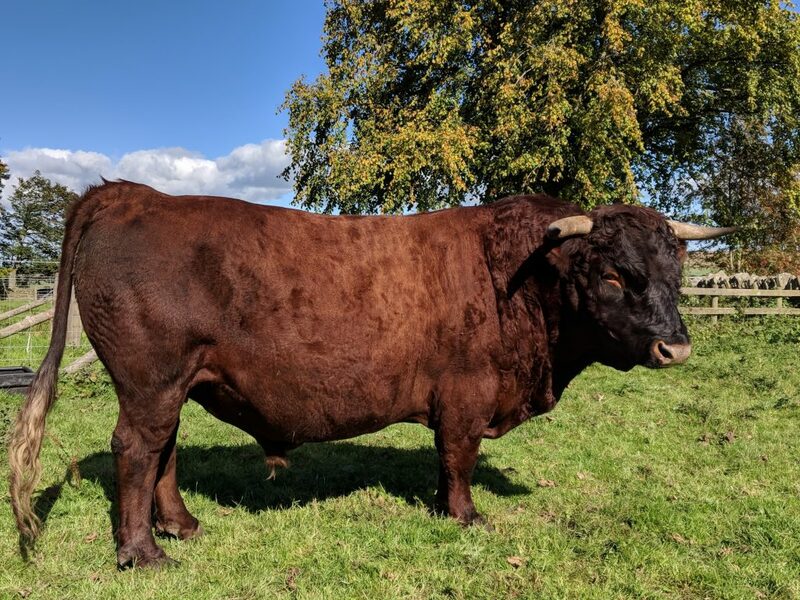 Also we had to consider that this year Primrose would be served as well but as she is a heifer from the first bull we borrowed – Rosewood Glenkinchie – we cannot use him again if we have any of his offspring. There’s no easy way to be sure exactly when each female gets served by the bull as we can’t spend every moment watching them but at different periods during his stay he will tend to hang around one of them for a few couple of days. By watching out for this behaviour we can make a note of the general date when she may well have been served and then count ahead about 9 months to predict the calving date. Not an exact science by any means but when this years calves arrived I was only out by roughly 2 days which was quite pleasing. At just over 4 months old now, the 2 calves from this year are filling out nicely and doing really well. Of course, Frank is a year older and as a result he obviously considers himself to be in charge. This year also saw us experiment with leaving Quinn to grow his horns rather than do any dehorning. This is normally done to prevent risk of injury to us while handling and to them in their occasional (but normal) disagreements, However the work to do this is always a traumatic experience for both us and the calf so this year we decided to leave Quinn alone and take any good or bad consequences in due course. Although I’m not supposed to have favourites, I do have a soft spot for Daisy since she has always given us naturally polled bull calves (i.e. no horns at all) so this has never been an issue for her offspring. 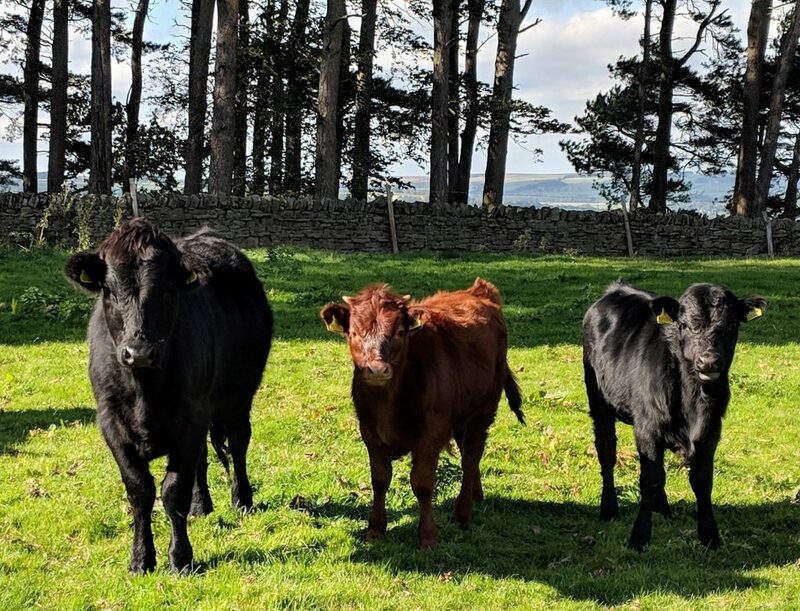 For the moment we’re back to a nice looking herd with the 3 cows and 3 bull calves but eventually we will need to face the fact that we cannot keep that quantity on the amount of land we have for them. Eventually it looks likely that we will have to sell Primrose because when they all calve next year there will definitely be too many for our available grazing land. It’s better to face up to this rather than overgrazing the land which would is just not a sustainable approach.